Very recently my first academic paper was published in a peer-reviewed journal. In my excitement I bombarded my Facebook friends with a link and no small amount of enthusiasm. Over the next few days I had the following conversation a number of times. Friend: Congrats on getting your article published. Me: Thanks! Did you have a read? Sort of. I think I understood the introduction, but after that I was completely lost. Um… Hey, have you seen the Wiki article about Palladium coins? At this point I was never quite sure what to say. These are clever people, but they couldn’t understand what I’d done. Is that my fault? Is this how it will always be? The accessibility of contemporary science is one of my reasons for wanting to write a blog like this, so my first paper seems like a perfect topic. Or, if you don’t have access to the pretty pay-walled version, the penultimate draft is here. The core idea of the paper is to use well established mathematical ideas to look at how a molecule is predicted to react. Clever computational chemists (including one of my supervisors) did some work and predicted that the molecule could react through two pathways. Imagine trying to navigate from one city to another city and Google maps shows you two routes. When we choose to take one route over another we might look at things like distance, estimated duration or how pretty the scenery will be. But molecules don’t care about scenery, so what makes them pick one pathway over another? If nobody has any money, then no-one rides on any of the roller coasters. This is equivalent to saying that at really low temperatures none of the molecules react. If we increase the amount of money each person has, then some of them will have enough to ride the cheaper roller coaster. When everyone has lots of money, the cost of the roller coaster is irrelevant, and people can ride both roller coasters. There is one further complication; the size of the gate. To extend the analogy, \(k_5\) and \(Z_5\) (estimated in section III a of the paper) are the size of the gates for each roller coaster. By using measurements of how many people rode on the roller coasters (i.e. how quickly the reaction progressed) in real life, I could use the model to estimate how big each gate is. It turns out that the more expensive roller coaster has the larger gate, which makes the analogy easier to use. This changes the third scenario, because once everyone can afford to ride the more expensive roller coaster nobody bothers with the cheaper but harder to access alternative. These sorts of general statements are interesting, but the point of the research was to come up with a proper justification for them. At this point I’m going to have to stretch the analogy a bit. The reaction releases energy, in the form of heat (the technical word is exothermic), which means that in this roller coaster world everyone gets paid a certain amount of money when they get off the roller coaster at the other end. The other complication is that some of the energy is always leaking from the test tube into the outside world; this can be thought of as pick-pockets stealing money from the people on the roller coaster. Including these two complications in the model means that it is possible for there to be a steady-state. A steady-state is where the total amount stays the same. For example, think about a bath partially filled with water and the plug removed. If the tap is pouring water in at the same rate that water is flowing down the plughole then the water level will be steady. This is a steady-state for the water level in the bath. In the roller coaster analogy it means that the total amount of money is constant. That is, the pick-pockets steal money just as fast as everyone receives it from riding on the roller coasters. In the actual reaction this means that energy (in the form of heat) is produced at the same rate that it is lost (to cooling). 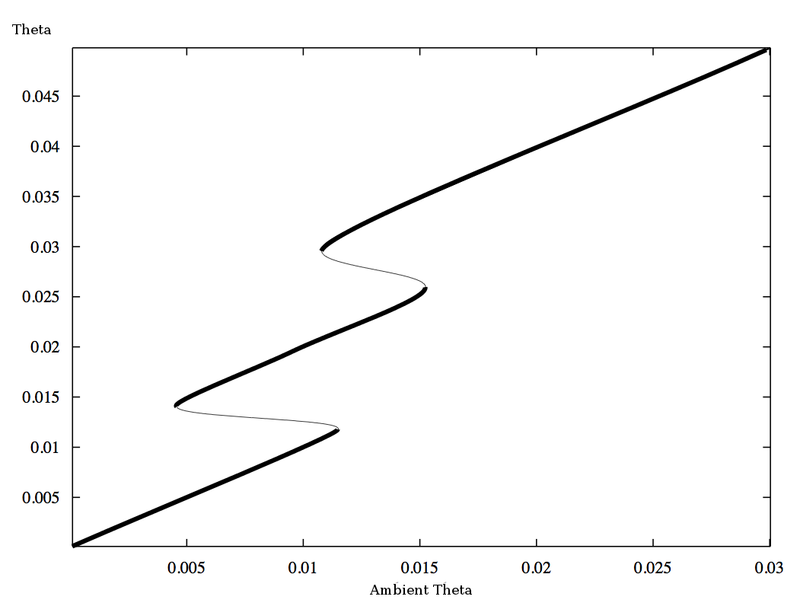 Figure 6 of the paper shows the temperature at the steady-state graphed against the ambient temperature (the temperature of the room the reaction is taking place in). The ambient temperature is how much money the general population has to start with and the equilibrium temperature is how much money they end up with. Figure 6 from the paper. It shows the temperature of the test-tube (y-axis) plotted against the ambient temperature (x-axis). Just to keep it nicely confusing, temperature is called “theta” (it’s to do with needing nondimensional variables for the maths). For the first section of the graph, these two are equal; nobody has enough money to ride either roller coaster, so nothing much happens. The next section of the graph, in which the line goes left as it goes up happens when people start having enough money to ride the cheaper roller coaster. But, this steady-state is unstable. It’s like balancing a ball on the flat spot at the top of a hill; theoretically it could stay there, but even the tiniest push will send it rolling away. The next thick segment of the line occurs when everyone has enough money to ride on the cheaper roller coaster, but because the gate is small, there is a limit to the number of people who can. The amount of money the people are receiving from riding the roller coaster is balanced by the amount stolen by pick-pockets. The next zig happens when the people start having enough money to ride the more expensive roller coaster. Remember, this roller coaster has a really big gate, so everyone who can afford to ride it can find a spot. The zig finishes when everyone has enough money to ride the expensive roller coaster (so nobody is riding the cheaper one). This is the most important point that the paper makes. When everybody is rich enough (i.e. at higher temperatures) everyone will ride the more expensive roller coaster (react via the direct pathway). Along the way my supervisors and I looked at other things. In particular, we were hoping to find things called limit cycles. In this case a limit cycle would mean that the amount of money everyone has goes up and down over time in some predictable way. We also tested a prediction made by two chemists in their Nature paper. Our model and their prediction are incompatible; so at least one of us is wrong, but that’s science. < Previous Is it possible to accidentally solve the wrong mathematical problem? In what contexts do people need to know the path rather than the destination for a reaction? There are a few reasons why we might want to know the pathway for a reaction rather than just the destination. One reason is that knowing the pathway allows chemists to make small changes to the molecule. Knowing what it looks like at every stage means that the chemist can make an informed decision about how to change the end result easily. Potential new drugs are often synthesised by changing an existing drug a little bit and seeing what difference it makes. Another reason is that it allows chemists to avoid using reactions that form really nasty compounds at some stage along the pathway. Or at least to make informed decisions about what equipment they need to use to make it safe. There are other reasons, including academic interest, but I'd say that those are the main ones.